As of this post, the Buildpack Registry contains over 100 buildpacks created by authors like you. Because of your contributions, Heroku developers can easily use languages and frameworks like Meteor, Elixir, and React in their applications. If you’ve created a custom buildpack and wish to share it with the community, visit Dev Center to learn more about registering your buildpack. Registration is simple; visit the Heroku Partner Portal and specify a namespace, name, description, and support level. After registration, your buildpack will be discoverable via the heroku buildpacks:search CLI command and eventually Heroku Elements (expected late 2018). Buildpack set. Next release on random-app-1234 will use jbyrum/special-python. As a buildpack author, the Buildpack Registry also provides you with a number of advanced features allowing you to publish a new version of your buildpack, as well as rollback if a new version doesn’t work as intended. 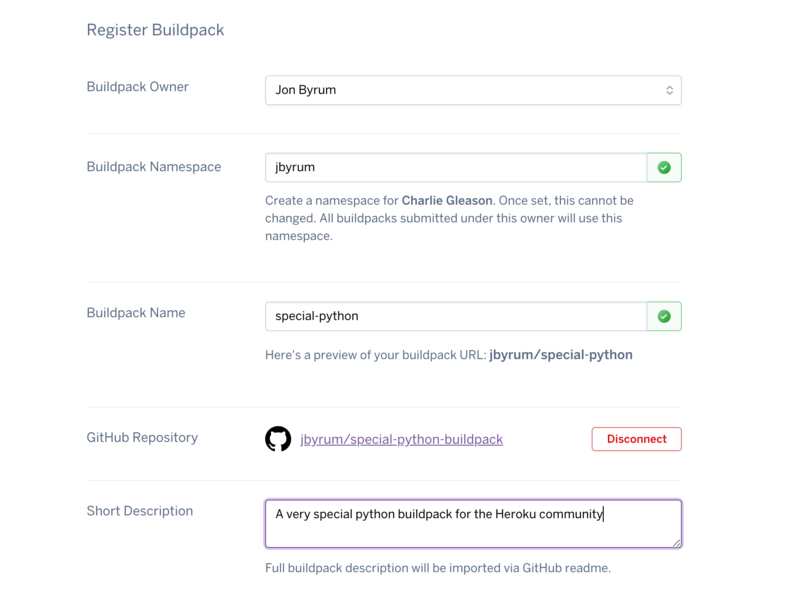 With yesterday’s announcement of the Cloud Native Buildpacks project, combined with our new Buildpack Registry, Heroku is committed to making buildpacks both an open standard and easy to share with the developer community. Learn more about creating a custom buildpack or registering your buildpack on Dev Center.